Zoe Shaw, Paediatric Sister in the Emergency Department at Barnsley Hospital, and Danny Williams recently embarked on the trip of a lifetime in aid of Barnsley Hospital Charity (reg. no. 1058037), to support the Tiny Hearts Appeal and the Paediatric Emergency Department. The Tiny Hearts Appeal is a campaign which aims to raise £1 million to support the development of a brand new, state of the art Special Care Baby Unit (SCBU) which will be situated alongside the Barnsley Birthing Centre. The new unit will enable the care team to adapt to each individual baby and their complex needs much more fluidly than before. The pair, from Barnsley named their team ‘Lexus go to Rome’ and have raised a fantastic £397 so far on their JustGiving page and are still collecting sponsorship, expected to take their total to around £600. 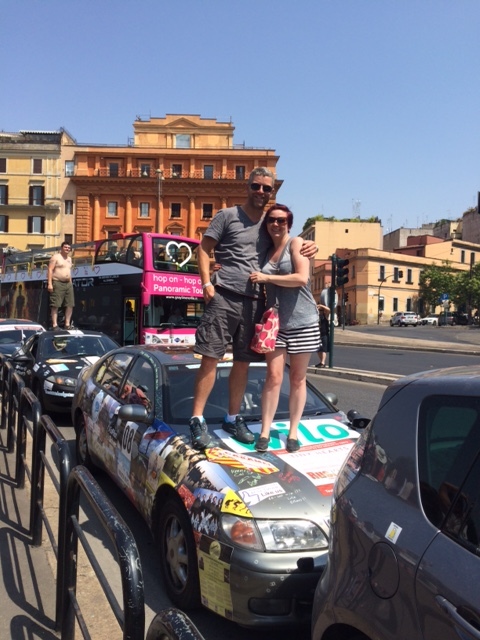 In 10 days, they travelled a staggering 4,500 mile journey from Edinburgh to Rome in a car that cost them just £500. Before the event, they told the charity how nervous they were, but the cause was close to their hearts as Danny’s daughter (now aged 11) spent time on the Special Care Baby Unit (SCBU) as a baby and they felt they wanted to support the unit in an extra special way. “It was amazing; I can’t tell you how good it was. The car behaved beautifully and I even survived the camping. Rust 2 Rome is not a trip for the faint hearted; Zoe and Danny faced extremely challenging roads in their car, a Lexus GS300. The pair travelled from Edinburgh to Rome in a charity rally with 44 other cars, and spent most of their nights camping. The event was completely self-funded so every penny raised goes direct to the charity. “We are extremely grateful for their support and admire their commitment and dedication to such a tough challenge.